Water Wally or just a crappy estimate? This month’s bill arrived in the mail the other day and I freaked out for a couple of seconds when I saw the average usage per day. Our household usually go through about 400L but this time round, the bill had jumped up to 857L! Cheap Geek and I started pointing the finger at our housemate’s boyfriend who had been staying over more and more frequently, but even with 4 people, we would still be using 214L each per day. Remember that push for 150L or less of water usage for one person per day? Going over 150L is really, really hard, unless you’re doing a lot of watering or car-washing. We scrutinised our bill more closely. Cheap Geek pointed to the ‘e’ above our average usage per day. ‘That’s an estimate.’ He ran out and checked the water meter. It was 49kL less than the figure on the bill. Crapballs! Remember that post I wrote about always checking the cheque twice? Here’s the proof. The guy from the water company listened to our concerns of ‘What kind of bulls&*% estimate is that?’ and told us he’d send someone out to check the meter. 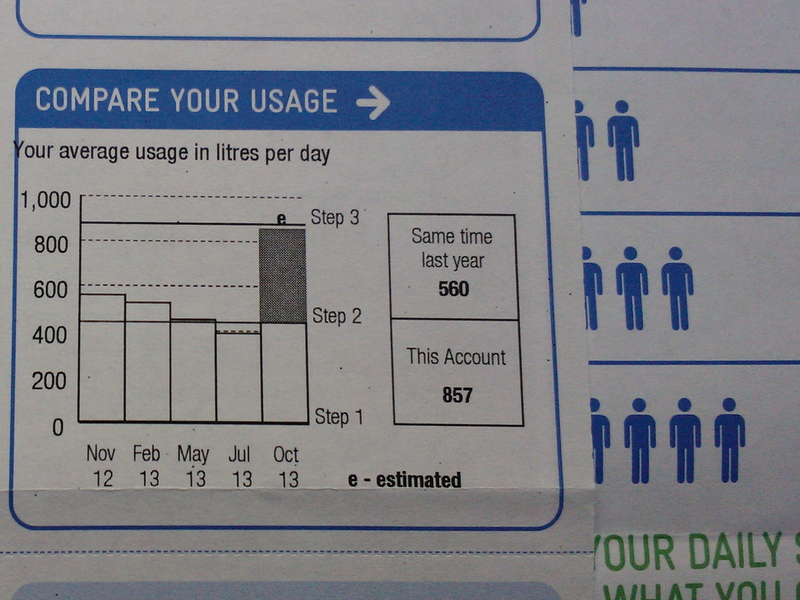 A couple of weeks later, our new bill came in with a new average daily water usage of 380L and a saving of $233.25.